Authors: Nosova M.N., Bondarchuk Y.A., Shakhmatov I.I., Matsyura A.V., Marshalkina P.S., Prokopets D.A. Aim. To study the influence of a single 24-hour episode of exposure to ultrasound waves propagating in air on microcirculation and parameters of hemostasis in rats. Methods. The study was performed on 28 Wistar male rats. The experimental group was exposed to ultrasound for 24 hours. Geometric mean frequency was 25 kHz, acoustic pressure was 84.3 dB. Parameters of microcirculation of experimental rats received by laser Doppler flowmetry were compared with those of intact animals. Also comparative analysis of platelet and coagulation hemostasis, anticoagulant and fibrinolytic plasma activity was performed in rats from both groups. Results. In experimental rats in response to 24-hour exposure to ultrasound, significant decrease of the studied active and passive factors of blood flow modulation occurred compared to those of intact animals: parameters of microcirculation, flax, endothelial and vasomotor wave amplitude, respiratory and pulse wave amplitude. When studying the parameters of hemostasis, significant hypercoagulation of extrinsic pathway and at the latest stages of coagulation which worsened with anticoagulant plasma activity inhibition along with decrease of fibrinolytic activity. The character of changes of hemostatic parameters confirmed the development of stress-reaction in rats registered during the study of microcirculation. Conclusion. 24-hour ultrasound exposure causes significant disorders of microcirculation and unfavorable shifts in hemostasis - the signs of distress. microcirculation, hemostatic system, ultrasound exposure. Beyer A.M., Freed J.K., Durand M.J. et al. Critical role for telomerase in the mechanism of flow-mediated dilation in the human microcirculation. Circulation Res. 2016; 118 (5): 856–866. 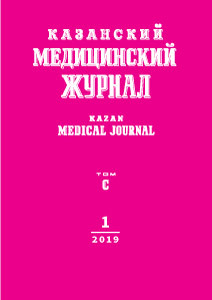 © 2019 Nosova M.N., Bondarchuk Y.A., Shakhmatov I.I., Matsyura A.V., Marshalkina P.S., Prokopets D.A.